We in the Pacific Northwest are used to rain. It comes in a drizzly gray form that permeates us to our core during the winter months. We endure it with a certain perverted pride, but that pride turns to pessimism this time of year. Even the natives start getting a little impatient as we wait for those glorious, sunny dry days of summer. Gray skies bring boxes of food. Still, the rain has reason for being. It keeps us green and the gray skies keep a lot of the winter chill away. Also, without it, growing all the varieties of food that we do in the Willamette Valley wouldn’t be possible. Ironically, as I carried boxes of food from the Oregon Food Bank to the distribution center at the True Life church in Beaverton, I was carrying the result of all that rain. A lot of that donated food probably depended on good old Northwest rain. Even the chickens who laid the eggs probably drank a little bit of the runoff. Sure there are gray skies out there, but there’s no reason we can’t have a sunny outlook. Today’s gift of time … Helped my co-worker Bob load, stack and sort food for his church’s food bank distribution. 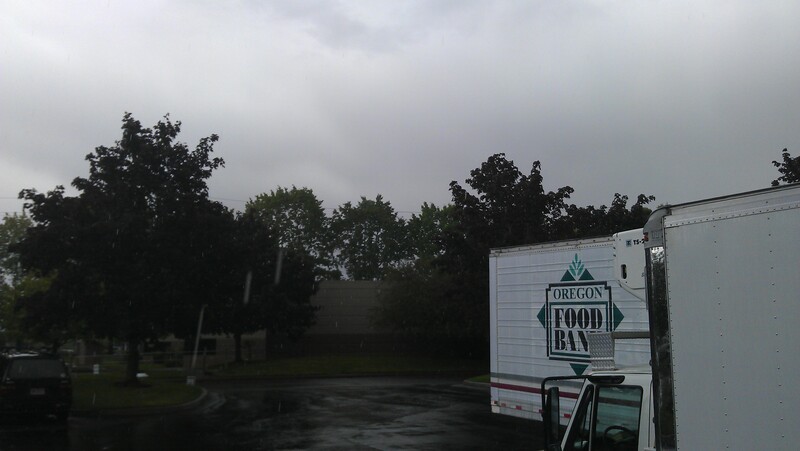 This entry was posted in In the community and tagged giving time, gray skies, Oregon Food Bank, rain, ray of sunshine. Bookmark the permalink.